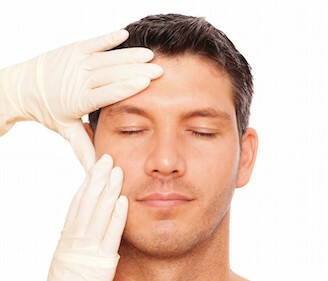 According to the American Society for Aesthetic Plastic Surgery, men account for one in 10 of all cosmetic procedures. These include facial enhancements – like facelifts, rhinoplasty (or nose jobs), eyelids, Botox, Dysport, fillers and even “smart lipo” for those growing “love handles” or belly fat. Some men seek breast reductions, and lasers commonly being used on men for facial blemishes and body or back hair. The truth is, not all body fat responds equally to exercise. Such “trouble spots” – especially the belly or waist – can be improved by the correct liposuction procedure, like liposculpture and laser liposuction, such as Slim Lipo. Some men seek a reduction of fatty breast tissue which may be a result of weight changes or a condition called gynecomastia (development of male breast tissue). Often this procedure can be performed with liposuction alone and enhanced results are possible with laser liposuction. Dr. Simon recently treated a young man with excessive breast tissue growth secondary to anabolic steroid use. The breast tissue and chest fat was addressed with laser liposuction (Slim Lipo) to unveil a chiseled chest with no scarring. Another male patient in his 50s was very fit and exercised regularly. However, the patient wanted to eliminate excess fat of the lower abdomen and waist. Dr. Simon treated the man successfully with liposculpture, leaving the patient – and his wife – very pleased with the results. To combat the signs of aging, plastic and cosmetic surgeons are using Botox, Dysport and fillers to address men’s facial wrinkles. They also are performing blepharoplasty (eyelid lift) to remove excess or droopy skin of the upper eyelids and reduce the puffy or tired appearance of the lower eyelids. Even simple cosmetic procedures can boost one’s self-esteem. Psychological studies have proven that a better physical appearance – for men and women – can enhance one’s confidence, job opportunities and career enhancement. And this isn’t just for older Baby Boomers or seniors. Generation X men – including 30-somethings – are feeling welcome in the plastic surgeon’s office.